Guided motorcycle tour, from 4 participants. On arrival in Cape Town we will meet you and take you to your hotel in the City. 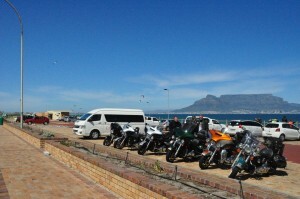 After freshening up enjoy a city tour with a visit to Table Mountain (weather dependant) followed by a transfer to the rental depot to collect the bikes. After the formalities and some time for T-Shirt shopping we enjoy a short warm-up Tour around Table Bay and enjoy the view across the Bay onto the city’s icon. From here we head out to Wellington where we stay on a wine farm. Our route takes us from Wellington to Franschhoek today. After a short stop at the Victor Verster Prison from which Nelson Mandela was officially released in 1990, a short shopping trip in the town and a cup of coffee we continue over th Franschhoek Pass to the Theewaterskloof Damm, the largest fresh water reservoir in the cape region. From here our journey continues via Villiersdorp to Worcester and through the Hex River Valley to Matroosberg. The Rooihoogte Pass and the Burgers Pass take us Montagu, our destination for today. Dinner at the hotel. The town of Montagu is the start of the route 62, often compared to the Route 66 in Amerika, only it is not as long. 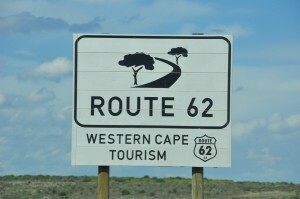 The two routes have much in common, both join 2 cities Route 66 = Chicago – Los Angeles, Route 62 = Cape Town – Port Elizabeth. Before we travel along the first part of the Route 62 today to Oudtshoorn, Ostrich Capitol of South Africa we take a short detour via Ashton to Swellendam. From here the scenic Tradouw Pass takes us back to the Route 62 at Barrydale. Now we continue through the little Karoo through Ladismith and Calitzdorp. We end our day with a visit to an Ostrich Farm where we can learn more about the largest flightless bird during a guided tour. Dinner at the lodge. We travel along the R 102, the old coastal road between Cape Town & Port Elizabeth, through the Tsitsikamma Forest and on to the Storms River Mouth. Our last stop for the day is at the Bloukrans Bridge. The brave have the opportunity to dare to jump from the world’s highest Bungee Jump Site at 216m. For the not so brave there is a viewing platform from which to watch the action. From here our journey continues via Plettenberg Bay to Knysna, the Heart of the Garden Route. Dinner at the Knysna Waterfront. Today’s highlight is the stop at Cape L’Agulhas, the southernmost tip of Africa. From here we travel via Bredarsdorp and Napier to Hermanus. Dinner in a Restaurant in Hermanus. We spend the morning in Hermanus on the lookout for whales. There is time for an optional whale watching boat trip. 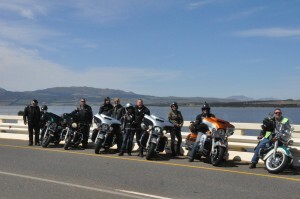 In the afternoon we ride along the coast via Kleinmond, Betty’s Bay and Pringle Bay along Clarence Drive to Cape Town. 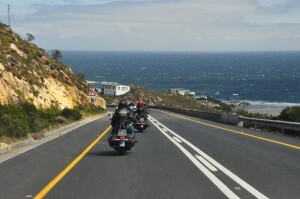 After a short trip on the highway down to False Bay we ride along the coast via Kalkbay, Fishhoek and Simons Town to the Cape of Good Hope. Enroute we stop to visit the penguins at Boulders Beach. Time at Cape Point and at the light house with lunch (own account). 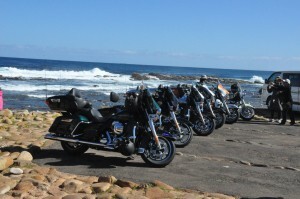 In the afternoon we ride back to Cape Town via Scarborough, Kommitjie and Chapman’s Peak Drive, along the Atlantic Coast and Camps Bay and Clifton.